If you were injured at the Port of Palm Beach then you are invited to call the Port of Palm Beach accident attorneys at the Wolfson Law Firm. Call us at (855) 987-2067 for your free and confidential consultation. We have helped injured victims since 1963 and we are standing by to help you too. Not as busy as the seaports in the South Florida neighborhood, the Port of Palm Beach is still the fourth busiest container seaport in the Sunshine State. It is an independent special taxing district, a Florida state sub-division. It is located in the Riviera Beach, 80 miles north of Miami, and 135 miles south of Canaveral. 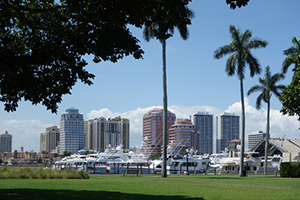 The West Palm Beach port itself covers almost 971 square miles in the Palm Beach County area. Unlike most of the American ports, this one is heavily focused on exporting American products, with 80% of all cargo being exported. Most often, the port handles materials such as liquid asphalt, molasses, diesel fuel and other bulk commodities. The MS Grand Celebration, and the Grand Classica in April of 2018, from the Bahamas Paradise Cruise Line launch from this port. Port of Palm Beach slip and fall accidents. Ports easily become dirty, but management has to keep them clean and safe for people. Port of Palm Beach trip and fall accidents. Again, cleanliness has to be one of the port’s top priorities for protecting visitors. Negligent security at Port of Palm Beach. Passenger terminal injuries at Port of Palm Beach. Criminal assaults and armed robberies of visitors at Port of Palm Beach as a result of negligent security. Severe injuries caused by machines operated by port employees at Port of Palm Beach. Poorly maintained fences, sidewalks and planks at the Port in Palm Beach. Call a Port of Palm Beach injury lawyer when you or your loved ones have suffered personal injuries there. Port of Palm Beach has to take all the possible measures for providing a safe environment for visitors of the seaport. When they fail to keep up with the safety standards, and that causes a personal injury, the port may very well be liable for that. They may have to pay any medical bills, lost wages, and other expenses related to the injury. These obligations for them come from Florida premises liability laws. At the Wolfson Law Firm, our Port of Palm Beach accident attorneys are here to help you and your loved ones after any type of accident. We offer free consultations and never charge you a fee unless we obtain compensation for you. Call us today at (855) 987-2067 and let us answer your questions and help you in your quest for justice.